Pinot Grigio belongs to "Riserva" series. This cuvee is only produced in particular year which Gravner could get special result in the vineyards. Production : around 1,500 bottles. One day, he was also impressed by glassware made by Massimo Lunardon in the restaurant, and he immediately visited Massimo's atelier. 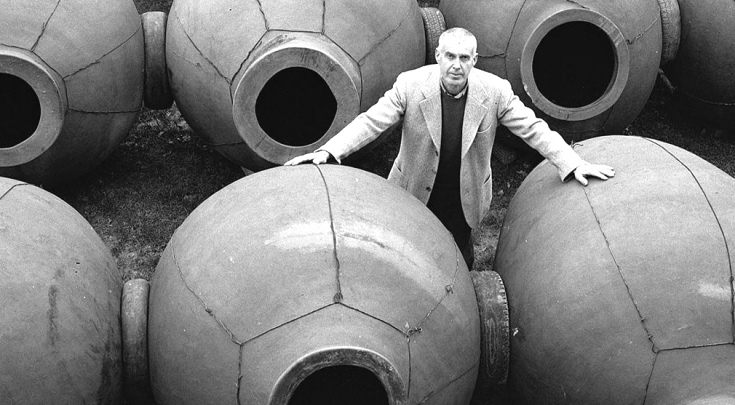 Massimo Lunardon exactly understood what Gravner wanted, and then they reached a consensus to make special wine glass right away. This glass is provided to official agent of Gravner only. All handmade by Massimo Lunardon, beautiful round shape and soft, gentle touch doesn't give any effect to the wine. No distance between wine and hand, the feeling is like drinking wine by hand. No risk of breakage of stem(one of the weak part of normal wine glass), easy to carry, so it is ideal glass for BYO as well.